Home » Online Services » Does Your Computer Meet Minimum Requirements to Run That Game? If you like the look of a new game and would like to buy it, the most obvious thing you have to do is make sure it’s going to run properly on your system. There’s little point in buying the latest blockbuster if you know your computer isn’t powerful enough to run it, but how do you know whether it will or not? The most important thing you need to find out before buying a game is if your system meets the minimum system requirements for that title. These are simply guidelines released by the games developer as to what specification hardware components you will need to get the game to run. The requirements aren’t an absolute rule and if your computer doesn’t quite meet them it may still work, but with reduced or poor performance. Most games will have 2 sets of requirements, Minimum and Recommended. Where minimum is what sort of hardware you need just to get the game to work properly on perhaps very low settings, recommended is more of an ideal specification to get the best experience and the most out of the game. This system requirement will obviously be far higher than the minimum but is what you should be looking to get close to or exceed. If you want to know what the requirements are for a game before you buy it, you could obviously go to a shop and look on the back of the box. Or you could go to the game’s website or download service and find out there. What if you’re not entirely sure what your exact model of graphics card or processor is and whether it actually meets the requirement or not? Well, finding out if your computer meets the minimum or even recommended system requirements and you can play that game you’ve been looking at is very easy with the help from a couple of websites that are specifically designed for the job. 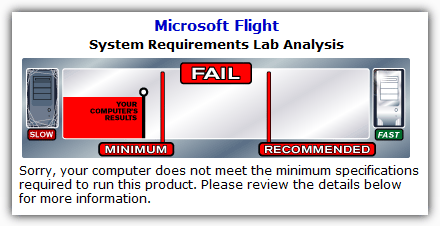 The System Requirements Lab is a long running and free service that easily and quickly tells you if your computer meets the minimum system requirements for a specific game. 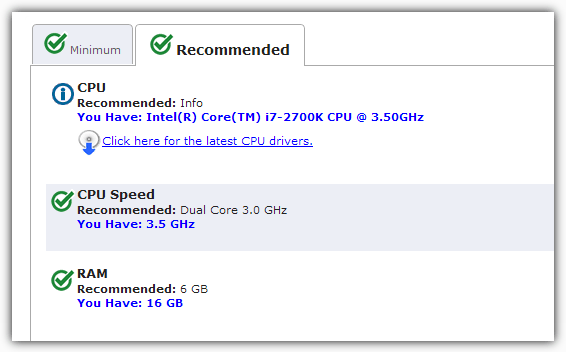 The website has a large database of known games and their official system requirements, and your computer is analyzed to see how it compares against them. 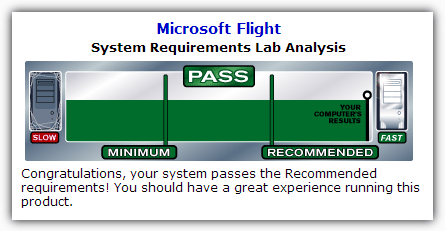 You will then be informed of the result and whether your computer has passed or failed the requirements test. In some cases if your computer has failed on a certain component not being of sufficient spec, you will be given suggested options such as upgrading the component or driver for your current hardware. On looking at these options though, they do nothing more than send you to an online retailer or suggest you install the DriverAgent driver updating tool and don’t offer any valuable help or advice. The System Requirements Lab website needs a recent version of Java installed on your machine. When you visit the site for the 1st time, use the drop down to find a game and then click the “Can you run it” button, you will be asked if a Java applet can be installed. This is the hardware analysis tool that gathers information about your system hardware and the process won’t work unless you install it. The text based summary analysis for each specific component will be displayed with what you have and the requirement it’s looking for. Only if it has been supplied by the game developer will there be a Recommended tab available. The CPU, installed memory, operating system, video adapter and required free disc space will be shown and compared. 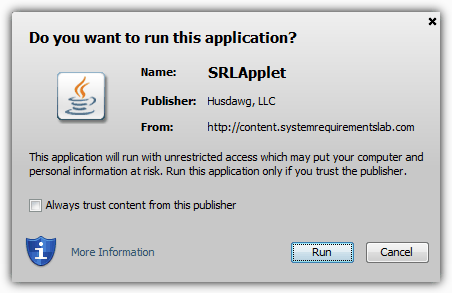 The Java applet can be removed again by going to Programs and Features (or Add /Remove Programs for XP) and uninstalling the “System Requirements Lab CYRI” by “Husdawg, LLC” entry. System Requirements Lab supports Windows XP, 2000, 2003, Vista and 7, and works on the Internet Explorer, Firefox and Chrome browsers. 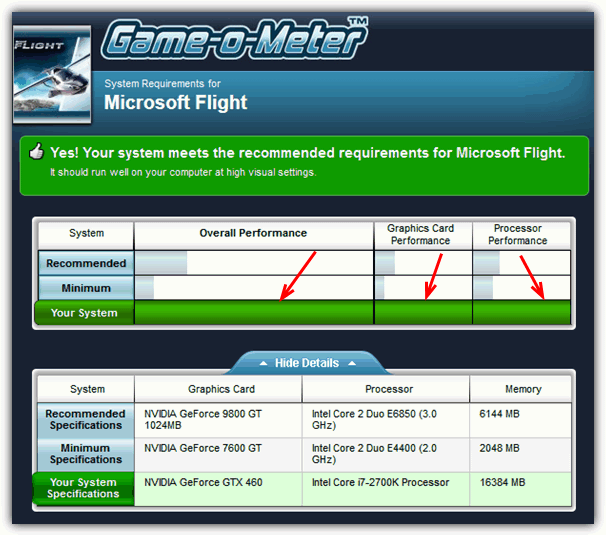 Another website service that runs in a similar way to System Requirements Lab is Game-o-Meter at yougamers.com. The website is owned by Futuremark, the people behind the popular 3DMark benchmark software so should be quite accurate at detecting your system hardware. Simply go to the webpage and search or browse for your required game. Once you have clicked on your game, or found it in the list and clicked the blue “Run now” button, there will be an empty chart with a green “Click Here to see your system’s performance”. Clicking this will ask your permission to install a Java applet the same way as System Requirements Lab, and again needs installing to gather your hardware specification. It can also be removed via the Control Panel and the entry is called “Futuremark Systeminfo” by “Futuremark Corporation”. After that and a short wait, your results will be shown. Understanding what’s displayed is simple and your system is displayed in green. If it’s bar is higher than the minimum or recommended bars then you’re system is perfectly capable of supporting the game. You might also get an additional line about what sort of settings you should be able to set to comfortably play the game. The one above says the system is capable of running Microsoft Flight with “High” visual settings. And below that is the official specifications along with your system’s so you can compare in terms of hardware components. Yougamers also has a few reviews for some games and other information such as screenshots and trailer / demo downloads. Game-o-Meter is supposed to work on just about any browser with Java installed and although it worked fine in IE, Chrome and Firefox, Opera didn’t work.